Hoppy Poppy Head Bangin' Desk Animals | OhGizmo! About a week ago over on BotJunkie, we wrote about Keepon, a cute little dancing robot. If you haven’t seen the music video, watch it instantly, it will absolutely 100% guaranteed make your day. 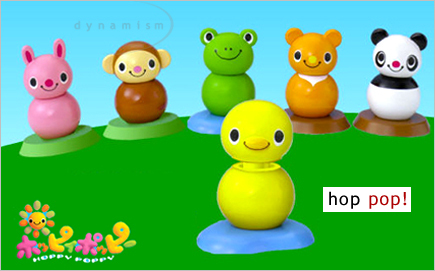 Unfortunately, Keepon is not available to buy, but if you’re desperate for something that bobs its head with music and looks like two nerf balls stuck together, you can always get yourself one of these Hoppy Poppys. They respond to noise by moving their heads up and down, and come in six species. One by itself costs $17, but if you feel the urge to purchase them all, it’s only $88. Video below. I love this post very much. I will certainly be back.